We’ve been using Happy Baby Cheeks Cloth Diaper Service (former owners of Nappy Nappy) in Vancouver since Madison was born. She was an ounce short of 8lbs at birth and they fit her well from day one. Madison is just over 5 months old now and we’re still happy with our diaper service so it’s time for a review! 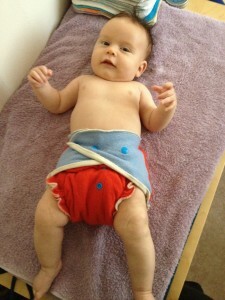 Our cloth diapering journey started with a Cloth Diaper 101 Workshop in Vancouver by New & Green Baby. Even though I’m a birth professional, I found the topic of cloth diapers absolutely overwhelming. 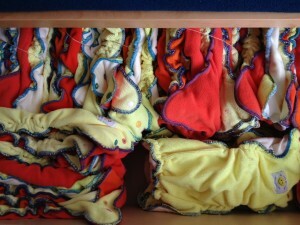 Every mom that I spoke to seemed to like a different brand or method of cloth diapering. I found the workshop really helpful to learn the ins, outs, advantages and disadvantages of different clothing diapering systems to determine what was best for US. I walked out of the workshop with my heart set on fitted diapers and wanted to research covers further to find the most natural, breathable, eco-friendly and non-toxic option. I was also excited to learn that Happy Baby Cheeks cloth diaper service uses fitted diapers which is exactly what I had decided we wanted to use after the cloth diaper workshop. Months before Madison arrived we decided to sign up for Happy Baby Cheeks and got started with their Pre-Birth Starter Package. It included 30 diapers, delivered to our door one week before our guess date and a 14 gallon pail with a non-toxic charcoal filter. We also decided to rent their diaper covers for the first month while she was in a newborn size, so we had time to test out different covers to see what we liked best before committing to purchasing them. What does using a diaper service look like? Once a week we get a delivery of clean diapers (more than enough to get us through a week.) We don’t have to be home because they have a swipe key and leave them at our front door. 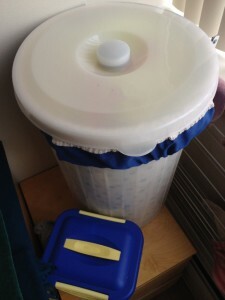 Her dirty diapers go into a dry pail that is lined with a reusable bag and has a lid. Once a week on our pick-up/drop-off day we put the dirty diaper bag outside our door and later in the day a clean bag of diapers appears 🙂 SIMPLE! My first impression of Happy Baby Cheeks was GREAT! They have awesome customer service which is really important to me! Their diapers fit Madison well (she’s graduated from small to medium now!) and the Mother-ease covers they have available for rent worked well during that first month when everything was new to us. The diapers are made to wick the moisture away from her skin and to the outside of the diaper so you’ll need a cover to make them waterproof! We fell in love with the one-size wool wraps from Lambie Love and have been using wool day and night for the past 4 months! She uses 1 wool cover overnight (10-12 hours without having to change her bum unless she poops!) and 1 wool cover for daytime. I love wool because it’s natural, non-toxic, breathable and eco-friendly. It can absorb up to 30% of its weight in liquid and will not feel wet until it has soaked up 60% of its weight. (Keeping baby drier!) You just hang to dry between uses and the urine evaporates from the fibers! It has antibacterial properties so that it does not harbour any bacteria or odour causing microbes. We only have to wash our wool once every 2 weeks or so unless we have a blowout, which is very rare with our Happy Baby Cheeks diapers! If you’re not sold on wool and prefer a plastic cover, we liked the fit of the Flip one-size covers with our Happy Baby Cheeks diapers. How does a cloth diaper service compare to disposables? Read more about Why Choose Cloth? as well as their natural laundering process. You can find Happy Baby Cheeks’ contact info here. They offer service for Vancouver, North Vancouver, West Vancouver, Burnaby, New Westminster, Richmond, Surrey, Delta, Langley, Pitt Meadows, Maple Ridge, Port Moody, Coquitlam, Port Coquitlam, and Aldergrove. Happy Baby Cheeks has a number of ways they make their affordable prices even lower. One is through the most generous referral program I’ve ever seen! For every friend that you refer you’ll receive 1 week of free diaper service and upon the 4th referral you’ll receive your diaper service for the remaining time that you need it… FOR FREE! P.S. If you’re in the market for cloth wipes I love, love, love my wipes made by a local mama: LilAdi They are the perfect size, thickness, softness and very absorbent (rather than just smearing everything around.) I spray them with some water, wipe Madison’s bum and then they go in a closed container. When it’s time to do laundry, I empty the container into the washing machine with all our towels and voila, they’re clean! Super easy to use! 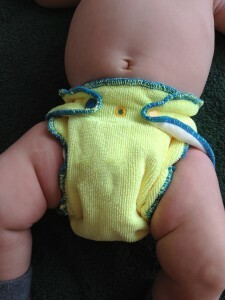 What are your favourite cloth diapers? I think that a diaper service is a great option, and so “low risk” when starting out. I’m swooning over your lovely wool wraps, they really are beautiful. I teach mini cloth diapering classes (just to show a few different brands and styles to confused parents) and even I am confused about them! Now that you brought my attention to this company, I see the truck everywhere! I never noticed it before. 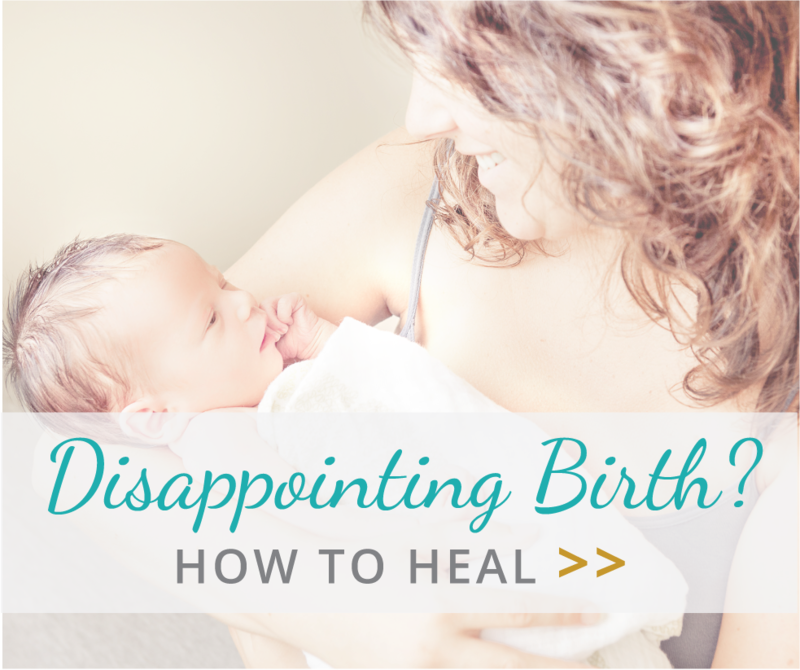 I read this blog when I was researching diaper services and I’m sad to say I had a terrible experience with them. They never seem to answer the phone, messages weren’t returned and my starter pack arrived 2 weeks late, which meant I was stranded for diapers for 2 whole weeks! I decided to cancel my service after that and was told I wasn’t allowed. When I refused to authorize their charges on my credit card they sent a collection company after me. I wouldn’t recommend them to anyone. Hi Christie, I’m so sorry to hear about your negative experience 🙁 We had a great experience with them for 18 months and so far every single one of my referrals (and there’s be a lot) have all had positive things to say. I appreciate you coming back to share your experience and I’m sorry it wasn’t a good one. My better half and I weighed our options when our little Elliott was on her way, and settled on cloth diapers, but since we rent, a service was the best route for us. We are currently half way through a 6 month pre-paid service, including extra inserts for overnight and the cloth wipes they provide. We absolutely love it. In the 5+ months with Elli, we have only had a couple of diaper rashes, and both were very very mild, the wicking of the diapers is great. I didn’t know about the referral program tho, i have a couple of friends with babies on the way! I highly highly recommend HBC.